Huang, C.; Soenen, S. J.; Rejman, J.etc.Magnetic Electrospun Fibers for Cancer Therapy. Advanced Functional Materials 2012, 22 (12), 2479-2486. Zhang, N.; Deng, Y.; Tai, Q.; etc. Electrospun TiO2 Nanofiber-Based Cell Capture Assay for Detecting Circulating Tumor Cells from Colorectal and Gastric Cancer Patients. Advanced Materials 2012, 24 (20), 2756-2760. Simsek, M.; Capkin, M.; Karakecili, A.; Gumusderelioglu, M., Chitosan and polycaprolactone membranes patterned via electrospinning: Effect of underlying chemistry and pattern characteristics on epithelial/fibroblastic cell behavior. Journal of biomedical materials research. Part A 2012, 100 (12), 3332-43. Ravichandran, R.; Venugopal, J. R.; Sundarrajan, S.; etc,.Minimally invasive injectable short nanofibers of poly(glycerol sebacate) for cardiac tissue engineering. Nanotechnology 2012, 23 (38), 385102. Cohen-Karni, T.; Jeong, K. J.; Tsui, J. H.; etc,. Nanocomposite Gold-Silk Nanofibers. Nano Letters 2012, 12 (10), 5403-5406. Ji, W.; Yang, F.; Ma, J.; etc, Incorporation of stromal cell-derived factor-1alpha in PCL/gelatin electrospun membranes for guided bone regeneration. Biomaterials 2013, 34 (3), 735-45. Jin, G.; Prabhakaran, M. P.; Kai, D.; etc., Tissue engineered plant extracts as nanofibrous wound dressing. Biomaterials 2013, 34 (3), 724-34. Hsu, P.-C.; Wu, H.; Carney, T. J.; etc,. Passivation Coating on Electrospun Copper Nanofibers for Stable Transparent Electrodes. Acs Nano 2012, 6 (6), 5150-5156. 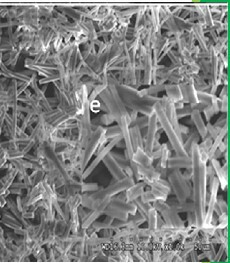 Hwang, T. H.; Lee, Y. M.; Kong, B.-S.; Seo, J.-S.; Choi, J. W., Electrospun Core-Shell Fibers for Robust Silicon Nanoparticle-Based Lithium Ion Battery Anodes. Nano Letters 2012, 12 (2), 802-807. Basturk, E.; Demir, S.; Danis, O.; Kahraman, M. V., Covalent immobilization of a-amylase onto thermally crosslinked electrospun PVA/PAA nanofibrous hybrid membranes. Journal of Applied Polymer Science 2013, 127 (1), 349-355. Chen, M.; Gao, S.; Dong, M.; etc,. Chitosan/siRNA Nanoparticles Encapsulated in PLGA Nanofibers for siRNA Delivery. Acs Nano 2012, 6 (6), 4835-4844. Van der Schueren, L.; De Meyer, T.; Steyaert, I.; etc,.Polycaprolactone and polycaprolactone/chitosan nanofibres functionalised with the pH-sensitive dye Nitrazine Yellow. Carbohydrate polymers 2013, 91 (1), 284-93.